" Ronald “Ronnie” Moipolai died last Thursday of an AIDS-related illness. He was 39. Ronnie was an early YouTube guitar star, bringing to the world’s attention a unique style of playing only known in Botswana. 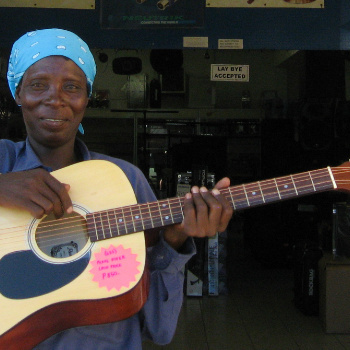 Instead of fretting the guitar from underneath, Botswana’s folk guitarists apply their fingerings from over the top of the guitar neck. In the hands of a master like Ronnie, this makes for a particularly acrobatic and theatrical style of play. Ronnie’s “Happy New Year” video was a viral masterpiece: a rag-tag guitarist in a cinderblock driveway effortlessly working the strings along the neck of the guitar with various fingers, the back of his hand, his wrist, his elbow. It got millions of views and tens of thousands of comments, in which people expressed their wonder and disbelief at what they were seeing and hearing. But, for Ronnie, it was just another day at the office. Ronnie was an authentic African troubadour. He rarely played formal gigs and didn’t seem to give much thought to where he’d lay his head at night. He’d just roam Botswana’s capital region playing at the informal speakeasies called chabins that crop up around farms and on the outskirts of towns. He’d often get paid by the song—by patrons, owners and passersby. His compositions generally dealt with local current events and life on the outskirts of society. Ronnie’s unlikely rise to YouTube stardom came in 2009 when John Vollebregt, a Dutch ex-pat living in Botswana, began uploading videos of the unique musicians he’d run across, whom he felt deserved a wider audience. Thanks to those videos, Ronnie eventually received quite a few visitors from abroad, including guitarists, ethnomusicologists and even the English soul singer Joss Stone, who made her own video with him in 2017. Ronnie’s video also inspired someone with a small record label to head out to Botswana to record and release the unique music happening there. That’s me. And on a personal note, I’d like to say that Ronnie was a remarkable presence and a joy to be around. With a smile that seemed to take up half his face, he radiated warmth, kindness and calm. It was a tremendous honor to spend time with Ronnie. He was an absolute original and unlike anyone I’ve ever met. To me, he seemed to live life entirely on his own terms. Perhaps it wasn’t always an easy life, but it was the life he chose, and that’s the life he expressed in his music: free and spontaneous, creative and warm. It wasn’t about notes and technique with Ronnie. With Ronnie, it was about magic. Although the term “free spirit” gets overused, it certainly applied to Ronnie. I know he will be missed by his large extended family and by the community of musicians and music lovers he served around Botswana. More broadly, music lovers around the world join them in mourning the loss of a gifted artist and a true original. From me to you, and my partners at Piranha Records in Germany too; travel well, Ronnie. Ke a leboga, rra! I know the minute you got to heaven they rushed to find you a guitar and they’re all mesmerized watching you play."